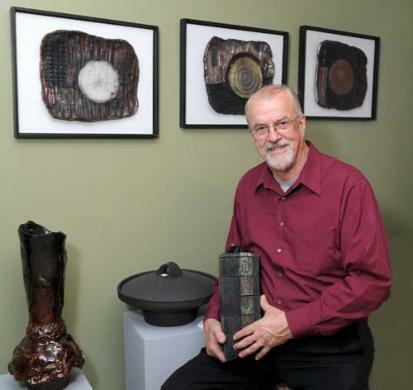 For the past two decades, Frans has been involved in ceramics. His interest in the craft has led him in many directions - finally settling himself in the somewhat unpredictable world of Raku. His passion for strong Earth colours and textures coupled with metallics, lets his forms speak for themselves. He is ever on the search for forms that allow him to express these passions - ones that best suit his personality and commitment to his craft. A quick study in methods, he soon began to learn techniques from prominent potters from all over. He acquired several certificates from programs at Sheridan College, Oakville Campus, Ontario, Canada. Those courses provided him with the formal education that allowed him to hone his skills. His works are on display in private collections in Greece, England, Germany, USA, Holland, Japan, and Canada. While residing in Mississauga, Ontario Canada - Frans teaches pottery at the Credit Valley Artisans in Georgetown and is a member of the Potters' Guild of Hamilton & Region.